Here’s a great view of Santa Maria crater made from a couple of raw images from the Opportunity rover, taken earlier this month and assembled by Stu Atkinson. (I did take the liberty of cropping the original image a bit and filling in some of the sky at upper right.) I particularly like the texture of the wind-sculpted dunes in the crater’s floor…with the sun illuminating the scene at a low angle from the left, the relief is very nicely accentuated. The dark area in the center is a result of combining two images together to make a panorama. For an illustration of the scale of Santa Maria crater click here. 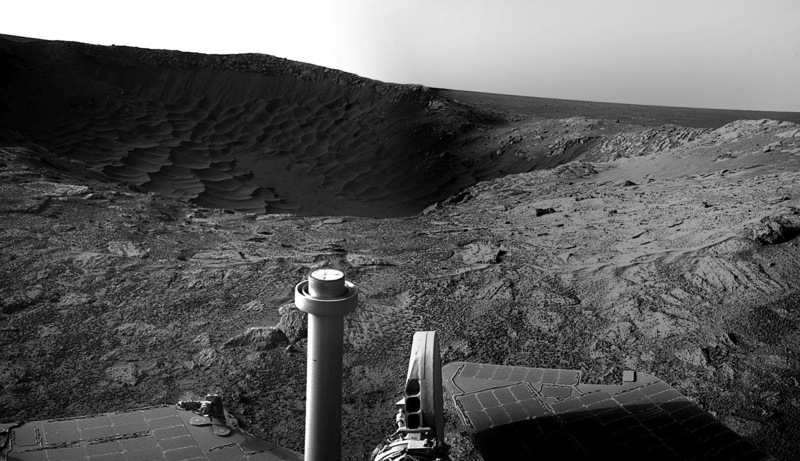 Santa Maria crater is Opportunity’s latest target of interest on her way across the sandy dunes of Mars’ Meridiani Plain towards the 13.7-mile-wide Endeavour Crater. In the tradition of naming Opportunity’s recently found craters after nautical vessels this particular excavation is named for one of Columbus’ three ships that sailed from Spain in 1492. To continue it further, the exploration rover team has been naming individual rocks and surface features around Santa Maria after members of Columbus’ crew. 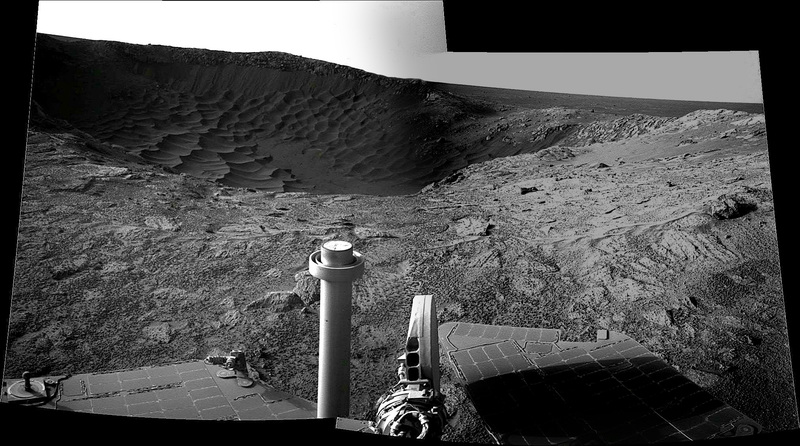 For more images and updates from Opportunity visit Stu’s site The Road to Endeavour. P.S. : For a really nicely lit portrait of Santa Maria crater, click here. It was assembled by unmanned spaceflight member “vikingmars” and really gives a nice sense of perspective of the entire scene!